Contemporary and elegant trolley suitable for use in public areas. High load capacity, hanging hook, dual handle and 2 fixed wheels for easy transportation of heavy luggage. 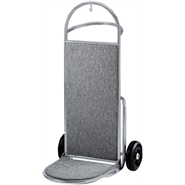 Grey carpeted loading base helps protect luggage. 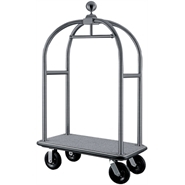 Contemporary and elegant brushed stainless steel trolley suitable for use in public areas. High load capacity for easy transportation of heavy luggage with 4 wheels: 2 swivel and 2 fixed. Grey carpeted loading base and protective bumpers help to protect luggage.